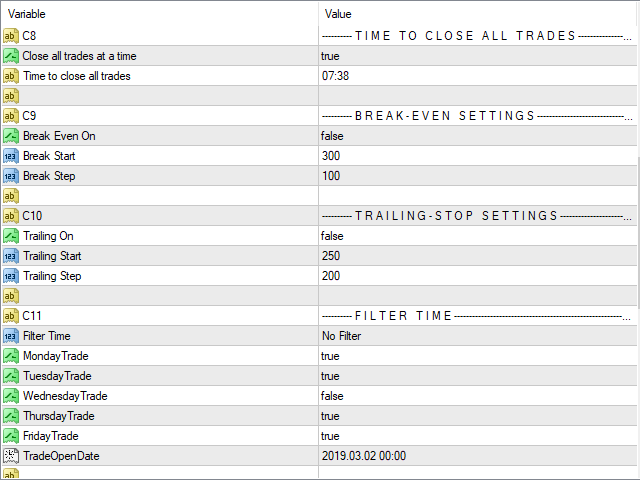 Set TakeProfit, StopLoss, Break-event or Trailing. Type or trade - Select any of trade type. Buy or Sell. None mean disable. Time to execute- Set the time for each trade. format like Hour:Min:Sec. 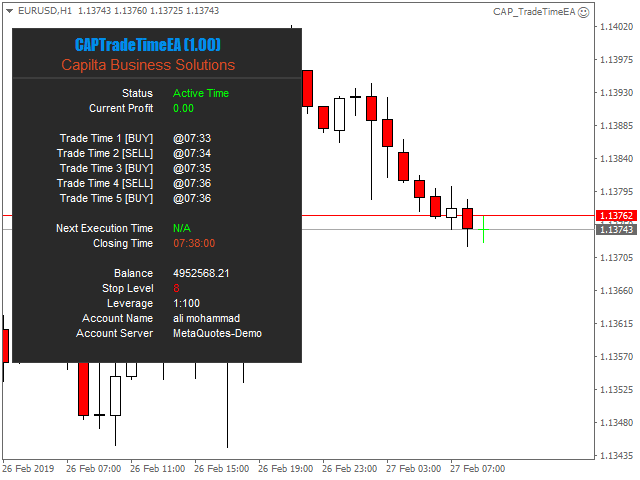 You have 1# to 6# Type and Time to set the time for each trade and the trading direction. 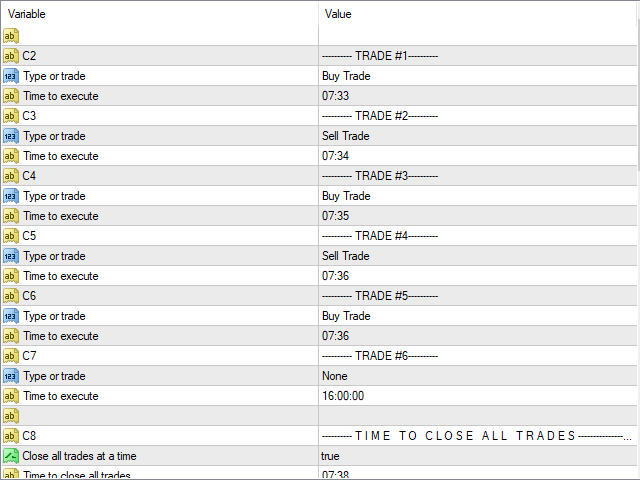 Close all trades at a time- Enable or disable the close all trades function and edit the time..
Time to close all trades - Set closing time. Filter Time - You can filter additional time filter. No Filter - Disable Filter. By Week - You can set additional execution time with weekly day. By Date - You can set execution time with selected day. MondayTrade - FridayTrade - When you select Filter Time = 'By Week' then also you can select your selected week day. TradeOpenDate - When you select Filter Time = 'By Day' then also you can select your selected date. LotsType: Select any of lots management type . EquityPercent: Lot is chosen automatically based on percentage of the equity. XBalance: Lot will increase base XBalance amount. 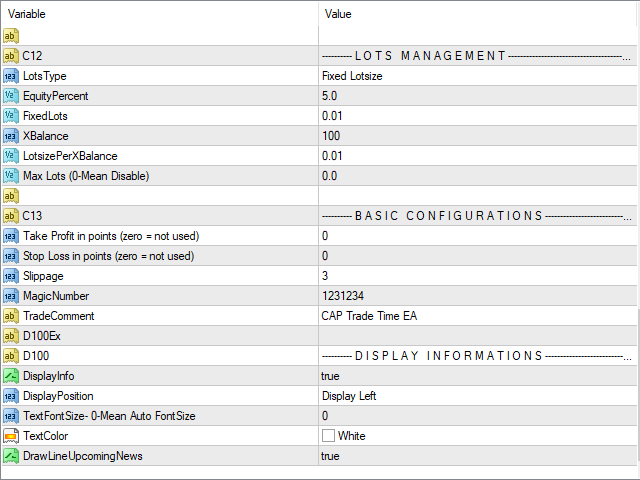 Calculate is (Your Current Balance/XBalance * LotsizePerXBalance = Your current lots size). LotsizePerXBalance: Lot size of XBalance.